(CW) 1) The Honorable Minister Louis Farrakhan spoke to the graduates. 2) National Executive Council attend the Saviours’ Day 2013 Auditing Graduation. From L-R: Student National Auditing Coordinator, Sis. A’ishah Muhammad, Student National MGT Captain, Sis. Sandy Muhammad, Student National Secretary, Bro. Berve Muhammad, Student National Protocol Coordinator, Bro. Thomas Muhammad 3) Graduates celebrate during the ceremony on Feb. 22. 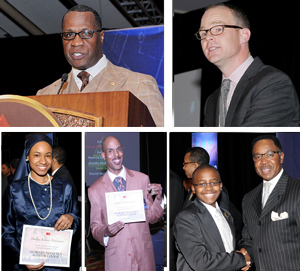 CHICAGO - Hundreds filled the International Ballroom at the Chicago Hilton February 22 to participate in the Nation of Islam’s Hubbard Dianetics Auditor’s Graduation for the third consecutive year. On May 8, 2010 Minister Farrakhan first introduced Dianetics to the Nation of Islam’s laborers across country. Ever since that date, members of the Nation have done everything possible to show their appreciation, followed his guidance and now it appears as if they are poised to take it to an even higher level. Mr. Woodruff read a small sampling of success stories written by those who have benefited from receiving service from the Nation of Islam’s auditors, as well as a long list of accomplishments showing that the Nation of Islam is on a consistent path of progress and service. 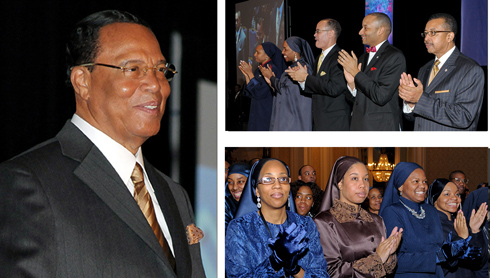 Currently, the Nation of Islam has 1,055 Certified Auditors. Among those are 526 auditors who have received their Gold Seal permanent certification, demonstrating consistent proficiency and results. Those achieving that level received gold lapel pin. Mr. Woodruff began reading off statistics of mosques across the country delivering context and perspective regarding the auditing technology and its delivery. The Central region logged more than 4,000 hours of auditing in 2012. The city of Detroit, which is the home of Muhammad Mosque No.1, delivered more Dianetics auditing than any other city in the Nation of Islam. (CW) Brother Tony Muhammad 2) Shane Woodruff, Vice-President of the Church of Scientology Celebrity Centre International 3) Graduates proudly displays their course completion certificates. (Far right) Rev. Alfreddie Johnson shown with a young Muslim auditor. 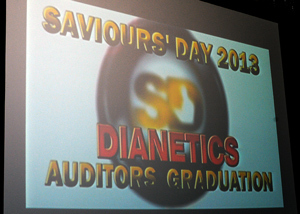 Calling the NOI’s Southern region a “Dianetics auditing machine,” they logged 2,700 hours of auditing delivered in 2012. 8,500 members of the Nation of Islam have participated in Dianetics seminars conducted by the Nation’s own auditors. The Southwest region of the Nation of Islam is one of two regions in which all the primary laborers are certified auditors. The Western region logged 1,113 hours of auditing in 2012. “To put it simply, Dianetics works,” said Min. Farrakhan’s Student Assistant Minister Ishmael Muhammad. “It’s a proven tool but we would not have that tool in our hands if it were not for a man who loved us enough to find something to help us to improve our condition,” he said to a cheering crowd. The hardworking and diligent Student National Auditing Coordinator Sis. A’ishah Muhammad also spoke delivering words of thanks and encouragement to the auditing coordinators and others who are on course across the nation. As an added bonus, the certified auditors were congratulated by the Honorable Minister Farrakhan himself. “I am deeply moved and eternally grateful to Allah for what I witnessed today,” said the Minister. “To see you walk across the stage and accept the Gold Seal auditors pin as well as your credentials, and to see how many have started this journey,” he added.